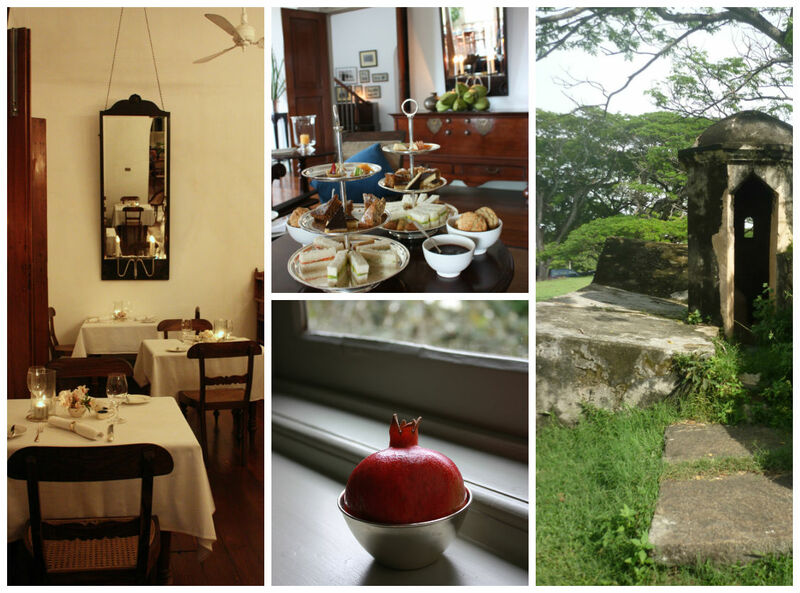 Of all the gorgeous hotels and resorts I’ve had the privilege to stay in, one of the most enchanting in every sense of the word, is the Amangalla in Galle Fort, Sri Lanka. 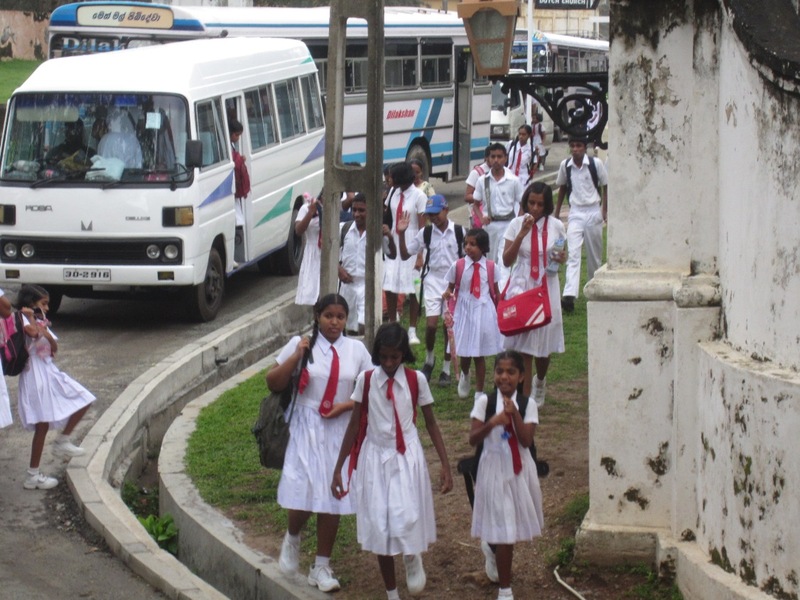 With the expressway that now connects Colombo the Fort Galle, the journey from the airport should take less than three hours. When I first visited, the highway was not yet open and our party of two families including three kids had to crawl four hours through terrible traffic to get to Amangalla. But Amangalla took care of us exceedingly well from the word go — in the minivan was a picnic basket full of cold towels and drinks, and a print out of possible attractions we could pop into along the torturous way, to stretch our legs and use ‘facilities’. Amangalla transports you back to a time when life moved at a less hurried pace. 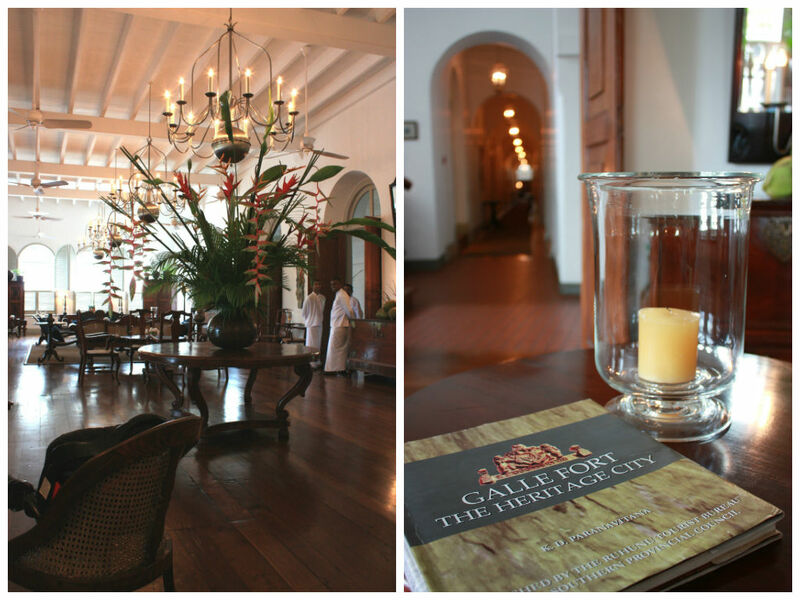 I loved the polished original hardwood floors, cane plantation chairs, cool shady verandahs, and slowly whirring fans. With just 28 rooms, and staff who gave very personalised service, it felt more like we were staying at a friend’s very large home. It was all about taking it easy here, and just soaking in the ‘now’. We started every morning with a walk on the old ramparts of the fort, watching local residents out for their own morning walks. On one side of the fortress walls was the charming UNESCO heritage town and the other was the modern chaos of traffic, the new town, the sea that lapped at certain parts and most fascinating, an open air market where local fishermen sold their catch under the shade of rain trees. Half an hour was all we needed to walk the full circle of the walled town. Then we headed back to breakfast of Sri Lankan string or rice hoppers with curry on the broad verandah of the hotel. On weekday mornings, we’d see children in their white uniforms dropped off from school buses and cars at the side of Amangalla. They would walk down the side of the hotel to their schools at the end of the lane–two mission schools not unlike our own in Singapore. We followed them to their school gates one morning, and watched the teachers in their bright saris usher the kids in. From a side building, we hear a student band practicing the odd notes on a trombone. Brings back memories of my own schooldays. 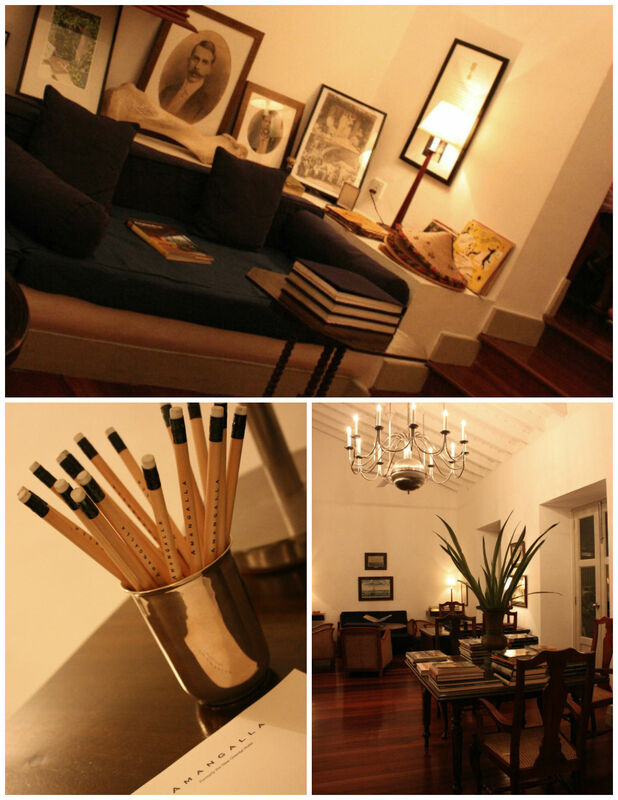 It’s these incidental vignettes of life in Fort Galle that make this place so magical. It feels like time had stood still here since the 1950s — vintage cars on the quiet streets, blackboards that still show the schedule of incoming ships, offices with wooden desks and typewriters still in use, old army barracks, the quiet parade square shaded by overarching rain trees. Just enchanting. We discovered quaint shops, cafes and huge bungalows behind deceptively small gates. Look out for wooden door stops and vintage style photo albums complete with black pages, tracing paper dividers, and raw silk covers just like those my grandmother used. In between, the hotel pampered us. After a yoga session in a garden pavilion, a butler came by with coconut water. As we returned from shopping jaunts, a staff member would be waiting at the hotel’s verandah bearing cold scented towels, and when we got onto a tuk-tuk to go to the beach a 10 minute ride away, they piled on fluffy towels for us to bring along, and laundered it later without extra charge. Every night, a little dessert will be delivered to the room while every child received a small gift left on his bed – a carved elephant, a wooden keychain, a paper kite, all nicely wrapped. Some nights, we would have dinner in. The hotel had only one restaurant, the one by the verandah. In the evening, dinner was a feast of light curries, sambols and pickles with fragrant rice. I discovered that Sri Lankan food was similar to Indian food, just lighter, slightly less spiced and left you feeling satiated, not bloated. Afternoon tea served in The Zaal, or main lobby was a treat. It was a traditional English affair of scones and clotted cream, cakes and cucumber sandwiches borne on silver tiered trays, with pots of Sri Lankan tea from the nearby plantations. Two of the hotel’s facilities turned out a huge hit. The Baths — we love the old fashioned word — were two massive private rooms which we could book for free. Each had a jacuzzi, cold plunge pool, sauna and shower, plus lockers, toilet and changing facilities. Our two families spent an afternoon there and the kids had a whale of a time. The other was Amangalla’s library which my daughter called ‘the ultimate hang out place’. It’s a beautifully cosy old fashioned library filled with vintage books for adults and kids, coffee table tomes, board games, and my favourite — old scrapbooks and photo albums showing the events and people of the hotel over the last century. Even though Amangalla is quite a new brand, the building which it occupies had always been a hotel. 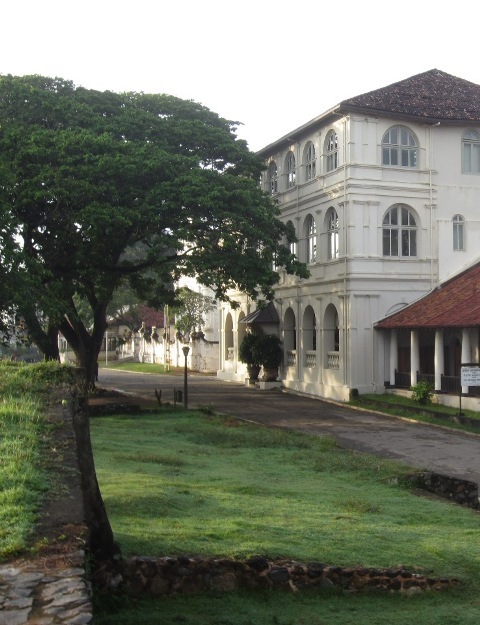 Its previous incarnation was the New Oriental Hotel (NOH), run by a family since 1865 and which was very much part of Galle Fort’s community and local history. The hotel became part of the Aman group only in 2004 when the last owner of the NOH passed on. But it’s heartwarming to see how the history of the NOH and the people that surrounded it are still remembered as part of Amangalla’s heritage in the sepia-toned photographs and well-thumbed scrapbooks laid out in the library. What’s more, the plates and flatware used in Amangalla’s dining room are still the original NOH china bearing its crest and initials. It’s really touching how the Amangalla acknowledges its legacy rather than wipe it out because it isn’t the same company that owned it. 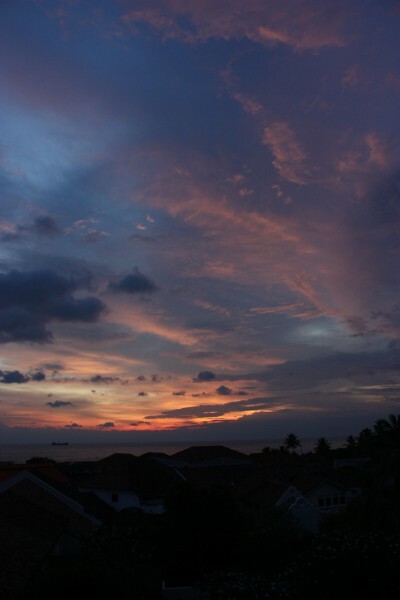 We ended our stay at Amangalla soaking in Galle’s famous sunset on the top floor of the old wing. Our butler had brought us a round of Pimms. 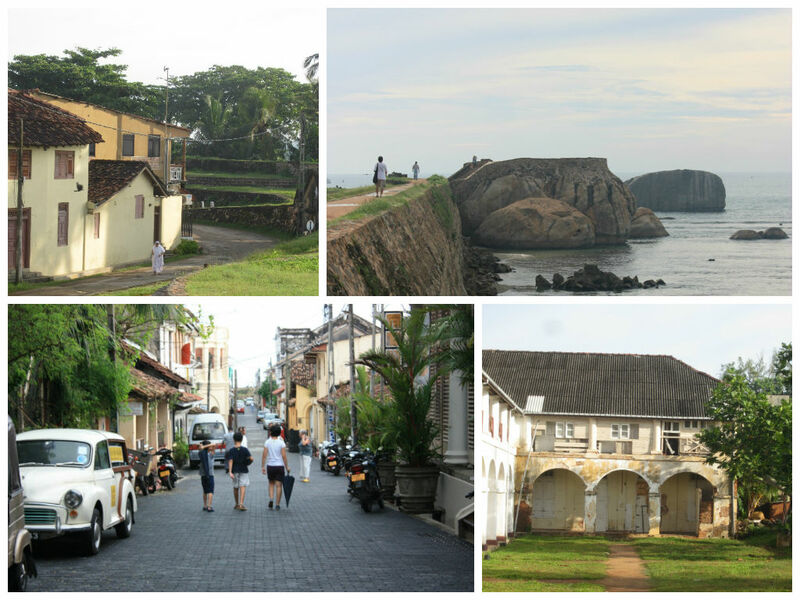 Seated on cane chairs in front large casement windows, we had a view that stretched over Galle’s red-tiled rooftops and out to sea. As the sun set and the sky turned rose, then blue and gold, quite by chance — for we had not encountered this in the days before — we heard a lone bugle play out The Last Post. It came from an army camp down the hill. Such a beautiful moment, it sent shivers up our spine. The photo above was taken just at that moment. And so we ended our stay at the immensely gracious Amangalla– impossibly elegant with an old world dignity, and perfectly timed. Nice post! I would suggest maybe using headings like the hotel or sightseeing or shopping etc. That way the words don’t look too overwhelming! What a lovely post! Beautiful hotel- I’m going to look it up! Thank you!